It is interesting to note that while Windows 10 is available for free to existing Windows 7, 8/8.1 users, a product key for Windows 7 or Windows 8/8.1 cannot activate Windows 10. Windows 10 needs a unique product license to get activated. Activation is a process that helps verify if the copy of Windows installed in the system is genuine and is only being used on computers in accordance with Microsoft’s license terms. This prevents the operating system from being copied, altered or in other words prevents any kind of software counterfeiting. If you are clean installing Windows 10 using bootable media on first attempt, you will have to start over from an activated Windows 7 or Windows 8.1 installation process. 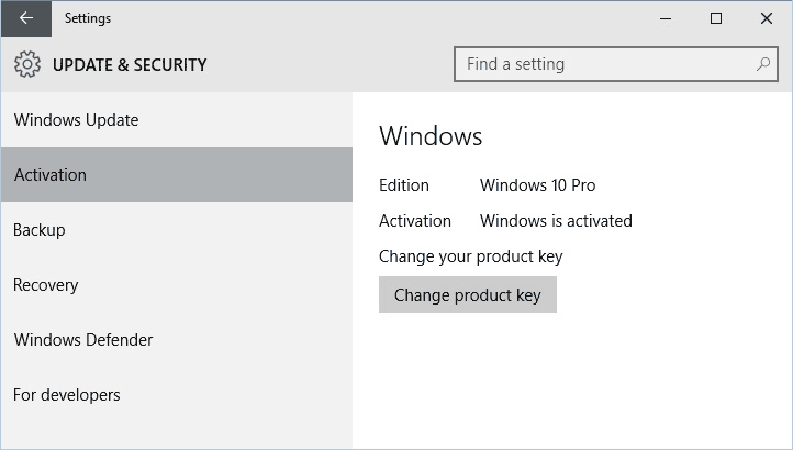 If you get any notification asking for a product key, you can click on Do this later and the Software Licensing service will activate Windows 10 automatically in a few days. This is rare now but persistent that the activation servers sometimes get busy because of the volume of upgrades, so you might get various error codes. However, Windows 10 is supposed to eventually get activated as long as you follow the correct upgrade method. Keep trying. But if you get a message that keeps saying “Your Windows will expire soon”, click here for our guide on solving the issue. 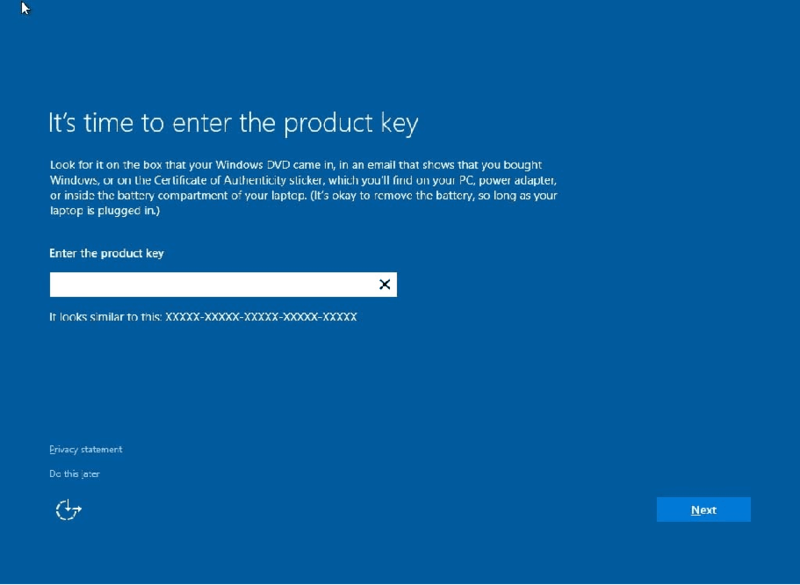 You need not know or save your Windows 10 product key as Windows 10 handles keys automatically, as opposed to how it was handled in the past. The Microsoft Product Activation Server registers your computer hardware (using MAC address) and qualifying operating system. Those servers are then auto-checked to validate your Windows 10 installation. Is it possible to clean install Windows 10 with the free upgrade? As stated before, Microsoft Product Activation servers need to register your computer hardware and qualifying OS. So, for the first time, you cannot perform clean installation without once having upgraded from Windows 7 or Windows 8.1. You can start with the clean installation process after this upgrade. You also can make a clean install from an ISO file instead of through the Windows Update process, but you need to have Windows 7 or 8.1 activated on your computer for that. So, ISO installation = possible, but not on a new computer. What happens when Windows 10 is NOT activated? Frustratingly, some users follow the correct procedure but Windows 10 still asks for Product Keys or prompts various activation errors. 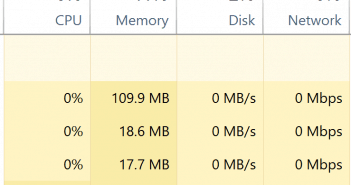 The first measure to make this stop and activate Windows 10 is to ensure active internet connection. If it does not activate even after detecting the internet connection, you can restart and try again or wait for a few days to get Windows 10 activated automatically. In some scenarios, Windows 10 setup initiated using the ISO file might prompt for a product key or indicate that a product key might not work with this edition. In this case, you can click on Do this later and wait for Windows 10 to get activated automatically in a few days. How to know if your copy of Windows 10 is activated? Press the new Start button. You might receive error messages saying that Windows 10 couldn’t be activated, here are a few reasons why it might not have worked, and some troubleshooting steps in order to fix the problem. Press the new Start button, then open Settings > Update & security > Activation. Click on Go to Store, and check if there is a valid product license available for your hardware. If a valid product license isn’t available, you’ll need to buy Windows from the Store. This only applies if you haven’t made any hardware changes to your computer. 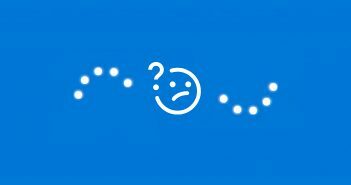 This issue might arise if you are using a third party application to add a display language that Windows does not support currently. To troubleshoot this issue, you can perform a System Restore that helps restoring your PC to an earlier time instant so that you could undo unfavourable changes made to Windows. If the step does not resolve the issue, you are probably running an invalid copy of Windows and need to buy a new one. Microsoft Product Activation Servers could not register the entitlement because you directly performed clean installation in the first time instead of upgrading to the OS from a qualifying version of Windows. To troubleshoot this, you will need to rollback to the previous version of Windows, ensure its activation and upgrade to Windows 10. The activation servers were overwhelmed when you tried to upgrade to Windows. If the copy of Windows 7 or Windows 8.1 was genuinely activated, then you could wait for a few days and then click on Activate now to validate Windows 10 or wait for a while to get it activated automatically. The issue might also arise if you are using an invalid product license key. 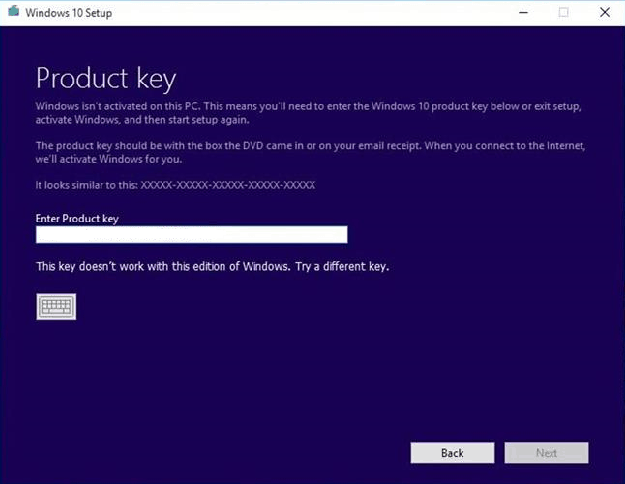 You certainly cannot use Windows 7 or Windows 8.1 product key to validate Windows 10. This happens when a previous version of Windows isn’t installed on your PC before you tried using a product key to upgrade to Windows 10. To fix this, you need to install Windows 7 or Windows 8.1 first on your PC or purchase a Windows 10 product key from Store. If you have a copy of Windows installed on more than one PC, the validation process might prompt an error because of an already used product key, or it is being used on more PCs than the Microsoft Software License Terms allow. If your product key is being used on more PCs than the Microsoft Software License Terms allow, you’ll need to buy a new product key as in the first type of error stated above. This might occur after installing third-party software that is incompatible to the system and modified system files specifically that Windows activation needs to accomplish activation. Performing System Restore is a good option to fix the issue. This will help remove any system file modification made in the past without even affecting your personal files. This issue is related to network connectivity. 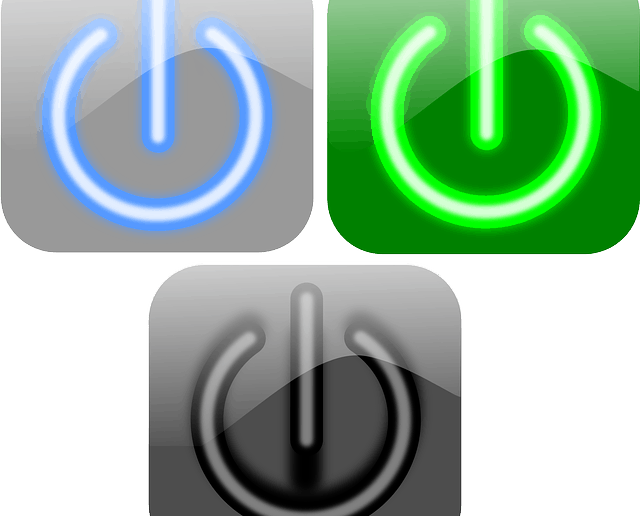 In this case you are trying to activate your system but aren’t connected to the network at your home/workplace or the connection is intermittent. If you’re connected to your work network and still get the error message, you might need to troubleshoot your network settings. Click on Change product key, and type your product key. To prevent these errors, you can also validate if your software is genuine and ready to get upgraded. Refer to the following link and click on the Validate Windows button. If the validation check fails, then you might click on Get Genuine button to get a WGA Kit. Pretty interesting information you have here. I’d just like to expound on error code 0xc004c008. Conventionally, there are two methods that can be used to fix this error code. The user can either call Microsoft or they can Run windows type SLUI.